Due to their popularity, we are pleased to announce that Monument and Dune are now available as standard in Victoria and New South Wales. These two join the line-up of the 9 standard colour options on offer in these states together with Black, Jasper, Paperbark, Surfmist, Woodland Grey, Pearl White and Ultra Silver. 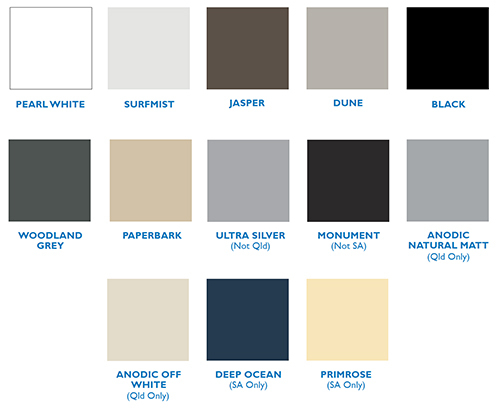 In South Australia, there are 10 standards on offer with the addition of Surfmist as a standard to the range of Black, Jasper, Paperbark, Surfmist, Dune, Woodland Grey, Pearl White, Ultra Silver, Deep Ocean and Primrose.For more information about powder coat colour options, speak with a representative today. For more information about our standard and non-standard aluminium powder coat colours, talk to your sales representative or email us at info@windowsanddoors.build.